Available from Imatech , HMD111 magnetic drills are ideal for those difficult to reach jobs where clearance is limited, such as behind the wheel on a truck frame. HMD111 magnetic drills weigh just 9.6kg (including battery) and measure 170mm (H) x 210mm (W) x 295mm (L), making them easy to handle. They also feature rear mounted controls for optimal ergonomics. Thanks to the patented rigid quill feed that prevents tool vibration, these magnetic drills retain a constant low profile without the need for gib and slide/way adjustments. HMD111 lightweight drills use Hougen RotaLoc Annular Cutters with push and turn style shank. 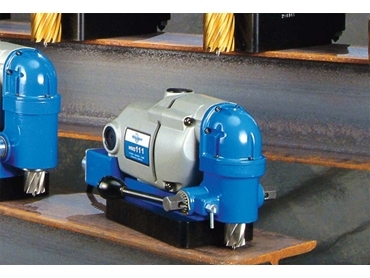 Additionally, the safety motor switch must be continuously pressed throughout operation and the motor will not operate without the magnet switch “on”.